While there are some interesting use cases in his presentation (embedded below), I am not sure that they will necessarily achieve success overnight. While it would be great to have a standardised solution for applications that rely on proximity services, the apps have already come up with their own solutions in the meantime. The dating app Tinder, for example, finds a date near where you are. It relies on GPS and I agree that some people would say that GPS consumes more power but its already available today. Another example is "Nearby Friends" from Facebook that allows to find your friends if they are nearby, perfect for a day when you have nothing better to do. With an App, I can be sure that my location is being shared only for one App. With a standardised solution, all my Apps have info about location that I may not necessarily want. There are pros and cons, not sure which will win here. 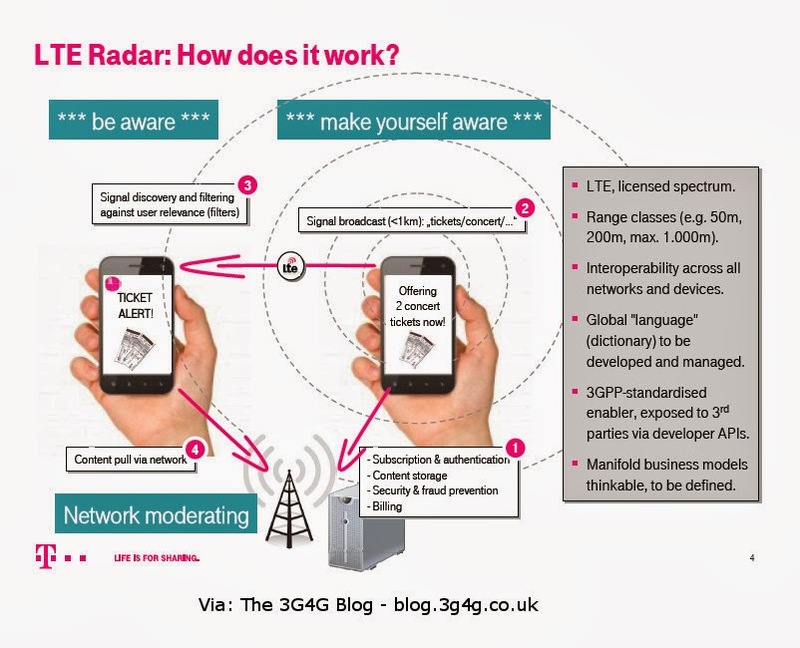 For anyone interested in going a bit more in detail about D2D, please check this excellent article by Dr. Alastair Bryon, titled "Opportunities and threats from LTE Device-to-Device (D2D) communication"
Do let me know what you think about the use cases. From the Mobile Marketing Association event held in Istanbul 14th -15th November 2012. Continuing on yesterdays theme of Location determination. I have heard in couple of presentations that in future based on multiple RF radios that we will carry, we could be uniquely identified on the planet even though there may not be a single device identifying us uniquely. 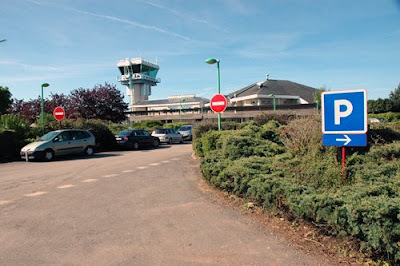 A similar project as above but for computers is the Panopticlick project which can be found here. Some of you may have read my earlier posts on stealing spectrum via Femtocells and using Femtocells abroad illegally. This presentation tries to answer one such problem on how do you find the location where GPS cannot be used. This could also be used in case of Cognitive Radios. See my old blog entry here. "How do we Make Location a Desirable User Experience?" Satellite navigation has evolved significantly in the past decade and the technology is now used in almost every walk of the life. Every body uses the satellite navigation to reach to certain destination. 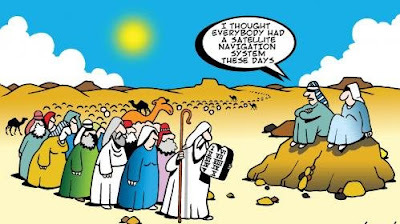 But imagine that you have a navigation tool or gadget which acts as your own personal travel guide. It has satellite navigation, so when you get into your car it can direct you to where you want to go. It can choose the most carbon-efficient route and make sure you avoid crowded town centres, traffic jams and road works. It can let you know where the next petrol station is, and whether there is an Italian restaurant near your hotel. Before you arrive you will know which of the town car parks have spaces left. And when you've finally parked the car, take your guide with you and it will direct you, on foot, to your final destination. For anyone who has found themselves stuck in a traffic jam, or has been unable to find a car park in a busy town centre, or has got lost on foot, it sounds too good to be true. Yet the technology to make it happen is already here. So why aren't we all carrying such a device in our pockets? The question which then arises is that why the universal travel widget isn't at hand. One of the reasons for that is that several different worlds have to collide and co-operate. First of all there is a massive competition together with a huge confusion regarding the platforms in which such device can be built on. To start with we have got proprietary platforms like TomTom and Garmin, and then we've got the at least five major mobile phone operating systems. The obvious competition between these different platforms has instigated some suspicion but apart from this the mobile companies also have yet to ¬recognize the potential of phones as navigation devices. You can argue that many mobile phones are already GPS-enabled but in my opinion this doesn't necessary make them effective at navigation. For instance try using your blackberry as a navigation device and you’ll find that battery has quickly drained out. The mobile phone world is slowly coming to terms with the needs of navigation on mobiles, such as better ¬battery life and bigger screens. Infact GPS alone doesn't offer the precision needed to navigate pedestrians, and so to be useful needs to be combined with another positioning service such as Wi-Fi. This has been done with the iPhone, for example. The accuracy and granularity of data used in satellite navigation systems is very critical and has to be improving all the time. The real problem lies in integration where the data needed to provide a coherent information service to a navigation device is held by different organisations in a number of different places. While there are companies that are providing some location-based information such as information about ATMs, speed cameras, train times or tourist sites but there is no company in my knowledge that offers everything. Combining all the information and hence provided through a single device at a one point of time that information isn't going to be easy. The challenges which lies in this are not solely technical for example there's a data aggregation problem to bring it altogether, including highway changes, updates from local authorities and then there's a physical problem in gathering all that up. Even if the above issues are solved there is still a major part of the problem which is revenue. 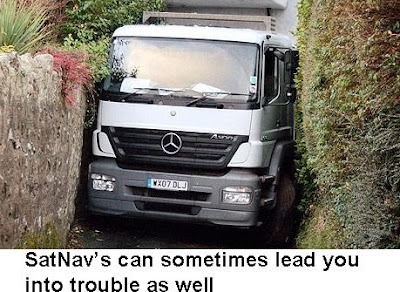 How one would make money out of integrated Satnav device? There's a difference between what can be done technically and a viable ¬product that can be sold. How do you turn that into something that fits in a business model?" Organisations that have valuable data rarely want to give it away for free, licences to reuse companies or government’s mapping data commercially are expensive. Similarly, there is no incentive for the Highways Agency or local authorities, for example, to share information about traffic conditions. Even the government website Transport Direct, which provides free up-to-date transport information, has restrictions on the integration of its content with other services. So now you may realize that how trying to highlight the potential of the problem. It’s a mammoth task to bring all the above information together into one place as everyone wants their pound of flesh because everyone has developed their own data infrastructure and it's just very difficult to get them to agree. I certainly hold the opinion that inspite of all these hiccups the demand for an all-in-one travel service almost certainly exists. People simply really want a so called integration or integrated device which can work across different ¬locations i.e. home, work, on the move etc. It’s evident from the above facts that the emergence of a ¬genuinely integrated solution will depend on a government initiative to force public sector organisations such as Highways Agencies, Transport for London and local authorities to collaborate, or on a private sector organisation taking a ¬commanding lead in terms of developing location technologies. Google is one such company which is creeping up with a whole series of ¬initiatives that are steadily putting the pieces in place. Best example for this is Google Maps which are now readily available on all mobile platforms and is integrated with traffic data from the Highways Agency. 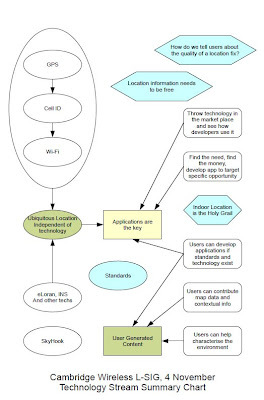 Not only this, the Google Maps application interface (API) allows third parties to build their own applications as well. Google, no doubt is leading with an example in terms of it’s initiatives towards serving the customers in best possible way. Google certainly knows what the customers want which I believe a mini innovation in these current economic climate. Location has always been such an absolutely fundamental framework for our lives, and we inevitably must embrace tools that allow us to manage that. I envisage a society in 20 years' time revolutionised by the ability to know all the location based information. Is 'Toilet Locator' the next killer App? I blogged earlier that Westminster city council in London using 'SatLav' service to guide you to nearest loo. 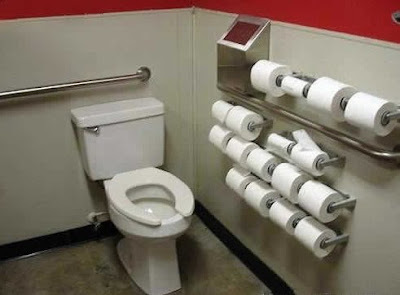 Now according to news item The Daily Telegraph, UK, The trials and tribulations of searching for the nearest public toilet have been eliminated in Japan – with the launch of mobile phone software guiding users to the nearest lavatories. The Check A Toilet programme, created by the software company Access Co, enables mobile phone users to search for maps highlighting the nearest public lavatory to their location. From train stations and beaches to department stores and parks, the software lists thousands of maps highlighting the location of public lavatories, including details of their facilities such as baby changing areas, according to reports in Mainichi Daily News. Users of the mobile lavatory locator are able to upload the free software from the Check A Toilet website whose lavatory location database stretches across Japan, from Tokyo to the northern city of Sapporo. The software reflects the continually growing importance of mobile phones in every day life in Japan, home to the largest mobile phone market in the world. Buying groceries, paying for train tickets and reserving cinema tickets are among a string of increasingly popular uses for mobile phones, 50 million of which are sold in Japan every year. The Check a Toilet Widget, developed in cooperation with NPO Check, who created the toilet map, is a free download available for phones running Windows Mobile or Symbian S60. Entering your location in the search window brings up a map with the local lavatories indexed by number, with successive clicks revealing whether they are equipped for baby-changing or are barrier-free. In Beijing (China), there are electronic maps at all public places with flashing lights showing public toilets. Beijing holds the world record for most public toilets in a city. Australian government has created a National Public Toilet map that can also be easily accessed via mobiles. 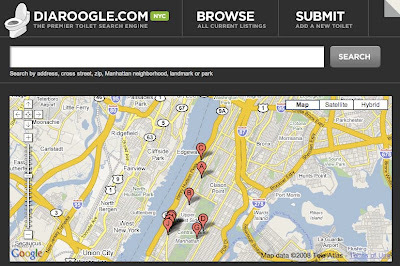 In New York, USA, Diaroogle is serving as a premier toilet search engine. Have2P is a 'Restroom Locator and Everyday Lifesaver' app on iPhone. Any more you know of? Feel free to add in the comments. Drivers in Westminster in London can now solve their parking problems by sending a text message. Westminster City Council, which pioneered a satellite navigation system to help people find nearby public toilets, has adapted its technology to help visitors park in the area. Drivers who text CARPARK to 80097 will get a text back within seconds giving them details of their nearest car parks, based on their current location. The service uses satellites to locate the phone when the message is sent allowing it to return information accurate to less than one mile. The technology directs users to the nearest two of the council's 14 car parks across Westminster. Locals can also text to receive an instant message back with details of the location and phone number of their nearest leisure centre, swimming pool, library, youth club or children's centre. The authority hopes the system will eventually be used nationwide. The service costs 25p (plus standard network charge) per text sent to the 80097 number. "By employing the latest mobile technology, councils like Westminster Council are helping to make residents' lives easier. Whether they want to pay the congestion charge via their mobile or use location based services to find their nearest recycling centres or licensed minicabs, mobile can offer an immediate solution, at any time and anywhere. We applaud Westminster Council for adding text-public conveniences to their list of services and look forward to working with them in the future." In future it could be used for a lot more different purposes. In UK, users are not allowed to use mobile while driving so how do they send the text message? You may send this text message while driving, in which case by the time you receive the response you have already travelled some distance. Generally SMS responses are quick but in congested situation they can take time. 25 pence + 10 pence network charge seems a lot to me if people are going to use this service regularly and its rolled out nationwide. A simpler alternative it to get a SatNav (available from 50 pounds) and they have Parking as points of interest. Google maps for mobile already uses LBS. Its just matter of time before they add this service and you can avail it free (or maybe pay some data charges if you are not on flat tariff). Anyone seen this or similar services in action? Please give your opinion. As the technology has evolved over the last decade so does various mobile applications and services related to it. In today’s competitive and saturated market operators and vendors are spending significant amount of time in drafting new strategies which will result in new revenue generation. It is all about making the consumer interested and getting into the feeling of the general public in terms of what they would like and what would interest them. Mobile advertising is one such step in that area. In the last year alone mobile advertising had emerged and there is a buzz out there related to it. I have noticed that people including myself take more notice of a mobile ad than advertising on TV or on a PC screen. And with a billion new phones being bought every year, the potential market is huge. Does this really mean that people out there really believe that it's going to be worth billions in just another two to three years? There is no denying from the fact that mobile phones offer advertisers many different ways to reach an audience. With more and more people accessing internet from their mobile there is a potential area for growth. Placing ads at the start of a video or adding them to the results of a mobile search are less intrusive forms of promotion. I think we'll see people responding well to this kind of ad.For one thing the credit crunch will force advertisers to reduce traditional outlets like print and TV, and push them to explore cheaper and more targeted avenues, such as mobile devices. So eventually, revenue from mobile advertising might rival that on other channels. But until then the industry will have to knock a few zeros off its forecasts. You mist have noticed receiving various SMS from your operator sending you a message related to some product or event. SMS advertising for consumer goods, such as food and fashion is rising significantly specially in Europe. Recent study by comScore suggested that more customers were getting ads for consumer goods such as food, fashion, restaurants, travel and financial services. In the three months ended August 2008, the number of offers received for non-mobile consumer goods rose 15 percent, compared to last year. Food is the fastest-growing category of SMS advertising since August 2007, at a rate of 53 percent, followed by clothing-fashion at 38 percent and restaurants at 37 percent. Mobile advertising is relatively new in the market and just like any other new thing it will take some time to settle down. 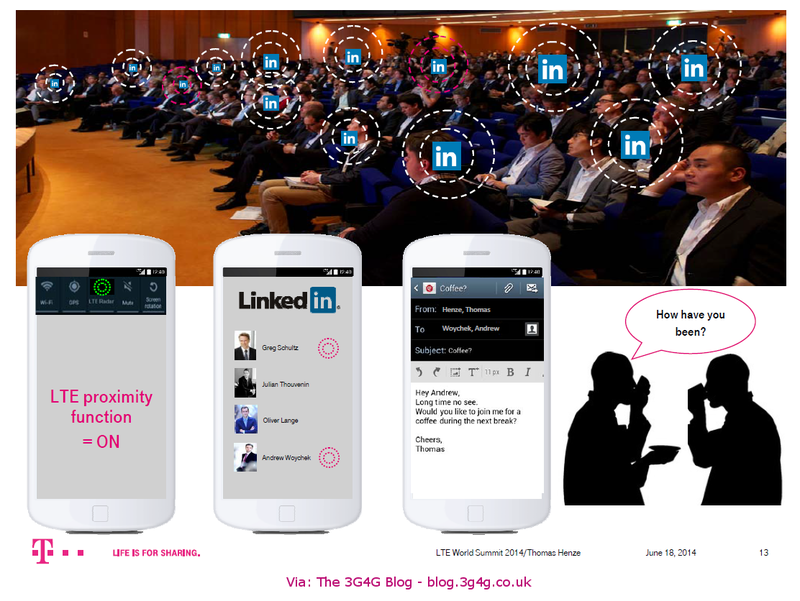 However there are some articles floating around which suggest that mobile advertising is overhyped. Although these suggestions are based on some fact and data collected by the reputed analysts, I still do believe that mobile advertising will pick up especially after the latest credit crunch. In my view every time we see a launch of a new product or new technologies there is an excitement around it and in this process sometimes it gets overhyped. Same might be true with mobile advertising as well. But like the Internet revolution before it, mobile needs to emerge from the technology foothills and develop media experiences and advertising solutions that delight and satisfy real consumers' needs and wants.